Last week, we linked to an interesting article on our Facebook page. We wanted to make you aware of the kinds of articles to dismiss when they come up in your feed. Chances are, you already took one look at it and knew it was not worth your time. However, we thought it would be fun to break down what’s wrong with these kinds of articles. So we asked a copywriter to help us dissect it. Here’s what Tegan Ang from Writing Your Story thought of this article. People lament that we don’t read anymore. I don’t believe that. I think a lot of us replaced traditional print reading with the internet. Each day, I’ll read between 10 and 20 articles on all sorts of topics. But I have never read an article like the one I’m about to talk about. If you haven’t read the article yet, you can read it here. It’s full of ghosts and monsters and scary shadows. Well, not really. But it might as well be. 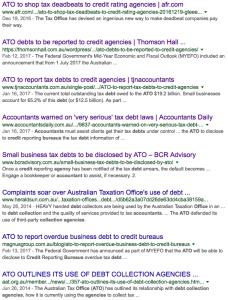 Australian Tax Office to bankrupt and destroy 1’000’s & 1’000’s of Small and Medium Size Businesses in 2017/2018-Every Australian Business is at RISK! This heading is pure click bait, using shock and fear to get you to click. And sadly, it works. I clicked, knowing that rarely does clickbait reveal particularly newsworthy. And neither does this. By who? They make it sound so shady and secretive, like they met a government informant in a trench coat in the darkest corner of a carpark, and received a manila folder full of paper. Passive voice is used a lot in news articles. Because it’s used a lot, it comes across as a more formal and serious way to convey information, but in reality, it’s used to omit the person doing the action for some reason. Maybe the person is unknown; maybe they don’t want to focus on the person. In this case, by using the passive voice, they want us to believe that they have access to something classified because they can’t reveal who told them. It is important to look at who’s writing the article. In this case, it’s written by a lender who has no established credibility. On its own, this isn’t a bad thing; the internet is available to all when it comes to content. But without some form of credibility or history of posting on the subject, we need to make sure we can see their bias and why they’ve written the way they have. The last paragraph gives us the bias. At the end, it’s not about contacting your accountant, your tax agent, or even the ATO to find out more. It’s about contacting his ‘friends at www.wefixcredit.com.au’. If this were a fairytale, then the writer is a prophet warning the town that evil is coming and there’s only one way to save themselves. Sounds more like a B-grade horror movie than a change in legislation whose impact can be mitigated by talking with your accountant or the ATO. There’s nothing wrong with pointing out a negative impact or outcome, but this article is pelting you with so much negativity that you get to the end and think the world really is ending. If this legislative change was only just announced and was coming in next week, I could understand the amount of hyperbole in this article. However, it’s not. It’s more than three months away (at the time of writing this post). The only reason to use this amount of negativity is to incite action through fear. When you claim something is going to happen, you need to show how you figured that out. It has been kept very quiet in the media. There are more articles from lawyers and other news websites talking about this upcoming change. While it is hard to keep opinion out of articles (and part of the reason we read someone’s articles regularly is that we like their take on matters), much of the opinion here is being used to create fear. Yes, it sounds nitpicky, but how seriously would you take an article written on the decline of Australia’s population if it’s written in lowercase and uses numbers instead of some letters? I believe that using good grammar shows that you respect your audience enough to provide clear, readable content. That means ensuring your grammar is on point. In this article, we see long sentences peppered with bracketed add-ons, which breaks the flow of the conversation. It’s like changing the subject back and forth; eventually, you don’t know what you were supposed to be talking about. Then there is the use of ‘synonyms’. I say ‘synonyms’ because they’re not really. Note this one: paid/satisfied/settled/extinguished. To their credit, I’ve never seen anyone do this in a blog post. But all writing styles are chosen for a reason. Here, there is no purpose in presenting the information this way. Pick a verb and stick with it. If you have multiple outcomes, list them. It’s like they wanted a ‘choose your own adventure’ style to establish their point, but then quickly abandoned it. They even repeated a word: expand/grow/expand. This also shows that they have not proofread what they wrote. Grammar, when used well, provides clarity and credibility. In this case, it’s building the fear and adding a little confusion into the mix. The article itself is not wholly without merit, but its lack of impartiality, its grammatical choices, and the huge red flag that is a click bait headline mean that you should read articles like this with caution and definitely do your own research on the matter. So there you have it, straight from the copywriter’s mouth. You need to keep your wits about you when it comes to taking advice from the internet. Remember, when it comes to your business, seek information from the right sources.